Nanomaterials and Polymer Nanocomposites: Raw Materials to Applications brings together the most recent research in nanoparticles and polymer nanocomposites for a range of applications. The book's coverage is comprehensive, starting with synthesis techniques, then moving to characterization and applications of several different classes of nanomaterial and nanoparticle in nanocomposites. 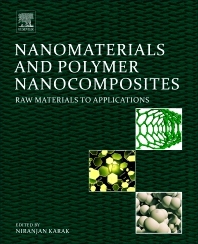 By presenting different nanomaterials, such as metal and metal oxides, clay and POSS, carbon nanotubes, cellulose and bio-based polymers in a structured manner, the book enables an efficient comparison of properties and capabilities for these advanced materials, making it relevant both for researchers in an academic environment and also industrial R&D. This book is particularly distinctive because it centers on the raw materials on which the nanocomposites are based, the biological properties of the range of materials discussed, and the environmental and economic considerations of different polymer systems. Niranjan Karak is Professor of Polymer Science and Technology and Head of the Chemical Sciences Department at Tezpur University, India. He has published over 87 research papers, two books and two chapters in two edited books, and also regularly acts as a reviewer for many international polymer journals.